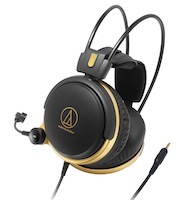 Audio-Technica Debuts New Over-Ear SonicFuel Headphones, First-Ever Gaming !! Audio-Technica’s new SonicFuel AX Series over-ear headphones feature sleek, comfortable design, superior sound quality and three models with smartphone and iPhone compatibility. AX models include the ATH-AX5iS, ATH-AX3iS and ATH-AX1iS with microphones, and the ATH-AX5 and ATH-AX3 without microphones (SRP: US$89.95 – US$39.95). Like all SonicFuel iS models, the ATH-AX5iS, ATH-AX3iS and ATH-AX1iS have universal smartphone compatibility; they’re fully compatible with today’s latest smartphone devices from companies like Apple, Samsung, HTC and more. The new SonicFuel CKX Series in-ear headphones are designed to take musical enjoyment to greater sonic heights. All feature ergonomic C-tip earpieces that nestle in the ear for a stay-in-place fit, and the “iS” models have smartphone and iPhone® capability with an in-line controller with microphone and volume adjustment for managing phone calls and music/video playback. Other features like the innovative 360-degree rotating eartips, flat tangle-free cord and useful accessories are also available on various models throughout the line. The SonicFuel in-ear headphones include the ATH-CKX9iS, ATH-CKX9, ATH-CKX7iS, ATH-CKX7, ATH-CKX5iS and ATH-CKX5, with suggested U.S. retail prices ranging from $99.95 to $44.95. Audio-Technica is introducing its first-ever gaming headsets, the closed-back ATH-AG1 and open-back ATH-ADG1 (SRP: US$249.95 and US$299.95). The premium-quality headphones utilize core elements of the company’s audiophile models to deliver an immersive sonic experience with exceptional clarity and dynamics, and a realistic soundstage that draws listeners completely into the gaming environment. Both include a built-in microphone and a detachable USB D/A converter/headphone amplifier along with additional gaming-specific features. The ATH-ANC70 is the newest member of Audio-Technica’s acclaimed QuietPoint active noise-cancelling headphones lineup. The ATH-ANC70 (SRP: US$199.95) provides up to 90% noise cancellation and offers a host of improvements, including a mic and controller for answering calls and controlling music, completely integrated electronics with all functionality built into the earcup, and a new comfort-fit design. Audio-Technica is expanding its SonicSport fitness-oriented headphones lineup with the ATH-CKP200iS ear hook style headphones with mic, volume and control functionality. The ATH-CKP200iS (SRP: $US44.95) has an IPX5-certified waterproof rating and is sweat-proof and washable. Its hinged ear hook adjusts around the ears for a perfect fit. The ATH-CKP200iS comes with both standard silicone and ridged XS/S/M and L eartips to provide a choice of greater sound isolation or allowing in a low amount of ambient sound for greater safety outdoors. The ATR 7000 Series VHF Wireless Microphone Systems are four new wireless systems designed for consumer use that combine long-range wireless performance with ease of use, clear, natural sound quality and outstanding value. Incorporating technologies that are directly drawn from Audio-Technica’s industry-standard professional wireless systems, the new models include the ATR7200 handheld wireless, ATR7100/L lavalier, ATR7100/H headworn and ATR7100/G guitar/instrument systems. Suggested retail prices range from US$129.95 to US$109.95. In addition, Audio-Technica is introducing its ATR3350iS lavalier mic with smartphone compatibility (SRP: US$29.95). Be the first to comment on "Audio-Technica Debuts New Over-Ear SonicFuel Headphones, First-Ever Gaming !!"